Every year, International Transgender Day of Visibility is honored on March 31st. This is a time to celebrate the lives of transgender people and recognize their achievements and the courage it takes to live authentically. 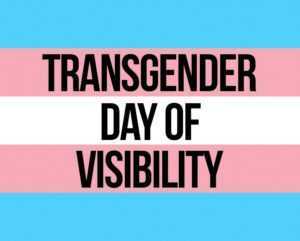 Yet, this day also acknowledges the issues and challenges this community faces and that because of discrimination, not every trans person can or wants to be visible. Supporting transgender people and the LGBTQ community is important to us at the National Runaway Safeline (NRS). A lot of our crisis contacts come from the LGBTQ community.. In fact, the number of connections from transgender and gender non-conforming youth has more than doubled in the past two years. For example, we often get calls from trans youth wanting to leave home because their parents don’t accept who they are. These connections are reflected in research, seeing that LGBTQ youth are at a disproportionate risk of experiencing homelessness compared to youth who identify as heterosexual and cisgender. While our crisis services are available 24/7, we also offer a free, evidence-based runaway prevention curriculum for educators, service providers, and mentors. Our Let’s Talk: Runaway Prevention Curriculum has 14 modules that aid youth in building life skills so that they can resolve problems before resorting to less safe options. This is especially helpful for exploring topics that may seem difficult to discuss in a way that is constructive and respectful of people’s identities. Module 12: Sexuality and Sexual Orientation of Let’s Talk provide lessons for youth about discovering not only their sexual identity but their gender identity as well. The activities in Let’s Talk are very adaptable and can be used for a wide audience; there are other modules that can be used when teaching topics specific to transgender youth. Module 7: National Safe Connections teaches participants about National Safe Place as they define what a safe place looks like and feels like to them. The activity “A Safe Place” from Module 7 can be adapted to talk about issues trans youth may face at home and school while discussing what makes them feel safe. For example, one youth may feel safe at home while another person may feel safe while they are with their school club. This is important because everyone deserves to feel safe, and identifying these places helps youth know where to turn to if they are feeling unsafe. Visibility and education can increase acceptance, so help us celebrate International Transgender Day of Visibility and the people that make up this wonderful community.